I had a reader with a great idea for a blog post. 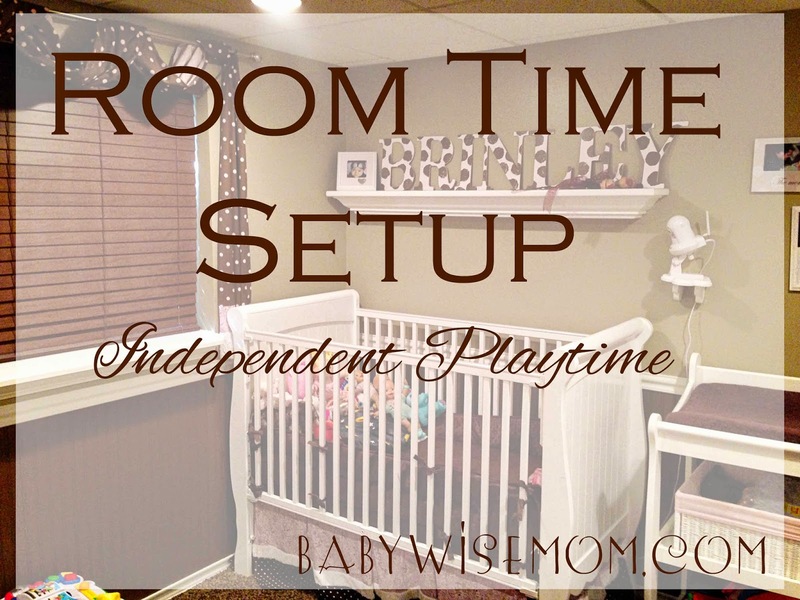 She wanted to know how I had Brinley’s room set up for room time. I took some pictures to give you an idea of what she has access to and sees when she does room time. Remember I am not huge on “baby proofing”–I am a “house proofing the baby” type. With that said, I like to remove real dangers from the room since she is in there unsupervised. What I don’t do is remove inconveniences for me. That means there have been days I have gone in to get her and found she has strewn the wet wipes around the room. Not fun. But it is a good learning moment for her. I have also gone in to find clothes all over the floor. Again, not fun. But it is a moment to say, “Brinley, we don’t make a big mess when we play in our rooms” and have her clean it up. Here we have the closet. There are many toys she can reach in the closet. There are also a few up on the shelf out of her reach. You can see that better in the photo below. The toys being on the shelf are an easy way for me to do a mini toy rotation with her toys. Rotating toys is a great way to keep kids interested in their toys. Rotating toys down is like having a birthday or Christmas. New toys they forgot about suddenly in reach. You can also see that she can reach her shorts and pants that are folded up on the shelves in her closet. This has been a problem a couple of times, but that is it. It really is an easy way to work on teaching your child to not ransack rooms when playing. This is a view a little removed from the closet. 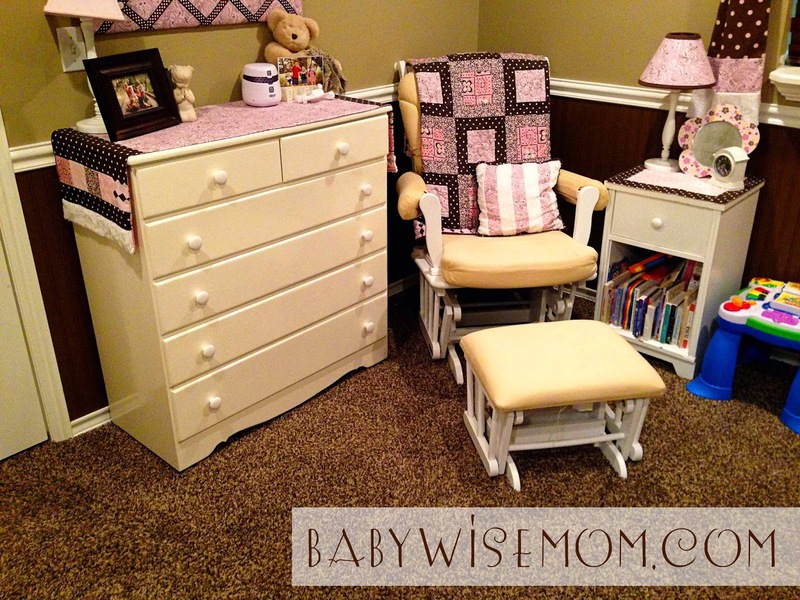 She has her changing table there. The bottom of the changing table has toys for her to play with. The middle shelf has two baskets. One is her hamper. The other is a basket with wet wipes and diapers. Again, there have been a couple of times she has gotten into those, but not often and it has been a good learning opportunity for her. The top of the changing table has some diaper ointment, gas drops, sometimes Tylenol…once she was tall enough to reach those things, I have to move them at Independent Playtime (room time). I don’t mind her learning on shorts or wet wipes, but I don’t want her learning on medicine of any sort. I keep those things out of her reach. 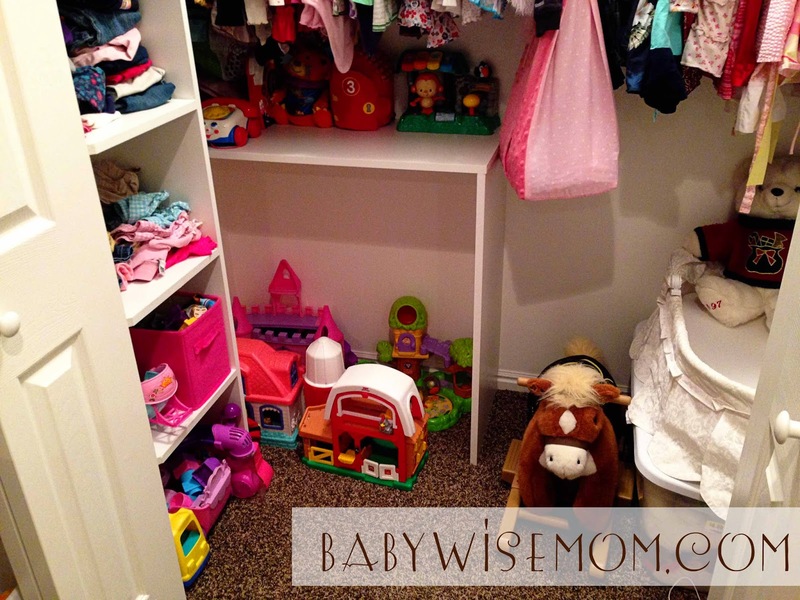 If you turn around at the closet, you will see her crib and reading corner. 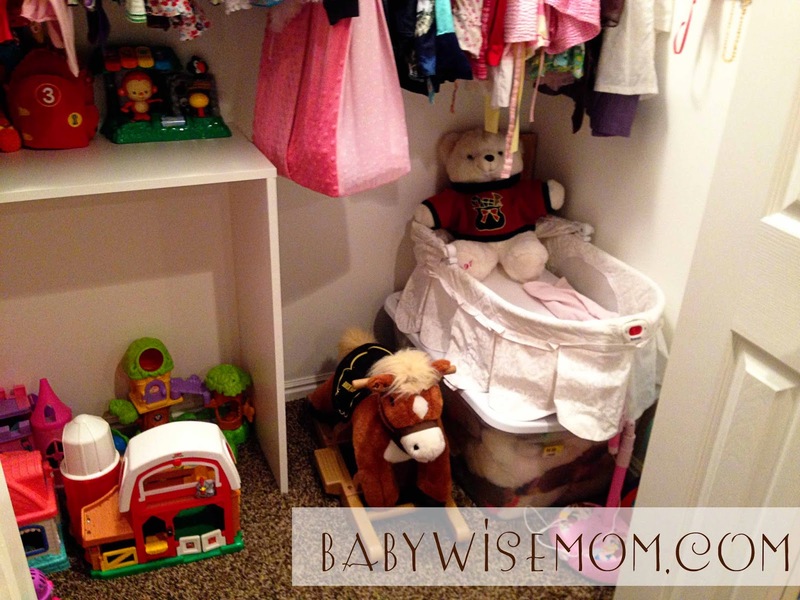 Under her crib, I have stored some more toys. This is another good “toy rotation” storage solution. I get those toys out every so often for a fun new toy time. I only keep books that are baby safe in her room during room time. Well, I only keep books that are baby safe at all times because I don’t want to forget one in there. You never know when a toddler will decide to experiement with ripping pages out of books. I am willing to refold laundry or put wet wipes back in the container, but I am not willing to destroy books. The books are a favorite thing for Brinley during Independent Playtime. 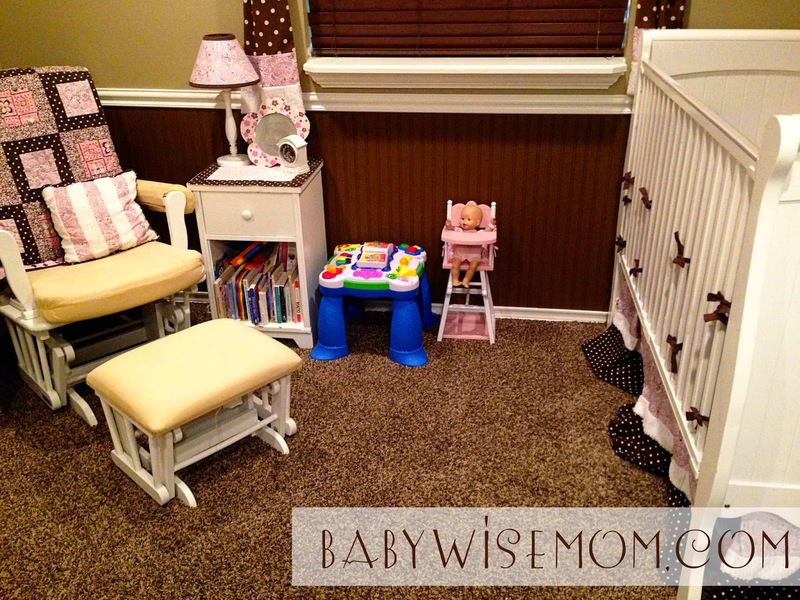 Each day at room time, I put the ottoman you see in Brinley’s crib. I don’t want her accidentally pinching her fingers on it. So that goes up for safety. The dresser was never a problem with McKenna, Kaitlyn, nor Brayden. Brinley has recently started opening the bottom two drawers to explore contents. That is our new thing to work on not doing during Independent Play. Previous Post Fall Break 2014! Toys–you don't want too many. Every few days-a week change out the toys in there. I would increase by five minutes every 3-7 days until you get the length you like. Hi! I have a 13 month old who does Independent Playtime quite well. I still do it in his crib, though. 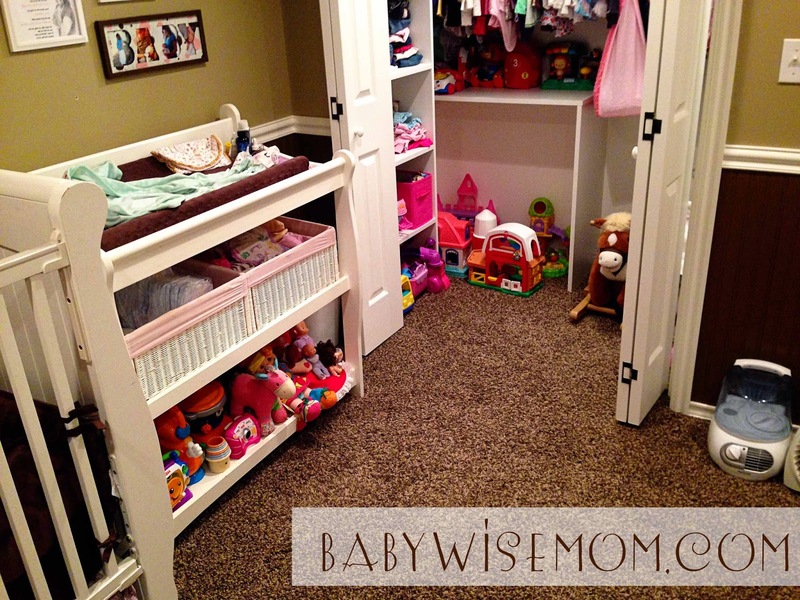 At what age do you move them from their crib/playpen to their room? My kids have had a range. Some were around a year. Others were closer to 2. Just do what you feel is best. If he starts to get restless, you can try moving him.